First of all, it is very difficult to unequivocally state which type of database is better. Each of them has its pros and cons. There are projects in which NoSQL databases are unfit, as well as projects in which we won’t be able to successfully deploy SQL databases. There are also a lot of myths about these two types of databases. I hope this short article will brighten you the basic differences between them. Unquestionably the greatest popularity continues to have a SQL database. 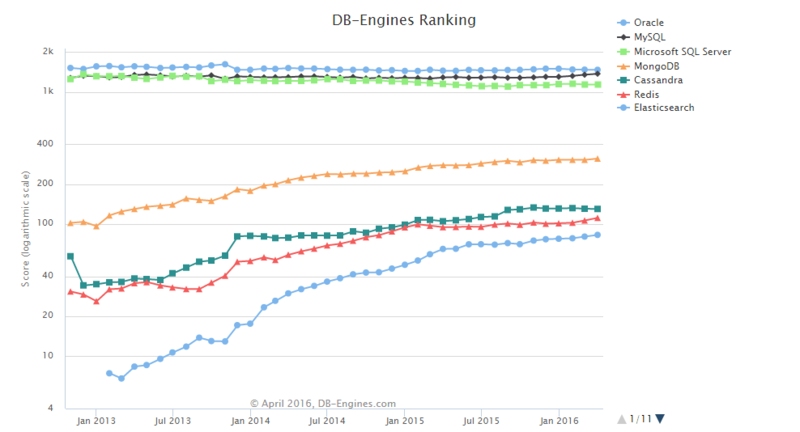 However, it is worth to observe how rapidly increasing use of NoSQL databases, mainly, the most popular of them MongoDB. Expanding definitions, SQL database is simply a relational databases, data organized in a repetitive structure permanently interrelated, NoSQL databases are simply a non-relational databases where data is collected in documents, which have their own structure. The first myth are people who think that it is better one database from another. As I wrote in the introduction we can’t compare them in that categories. There are many cases where SQL shouldn’t be implemented and in the other side are projects where NoSQL is the biggest devil that exists. If you are chose the type of database, analyze exactly what are you doing, which features the database will have to meet. Then select one or the other. Second case is performance. It accepted that NoSQL databases are faster and more efficient than SQL databases. But somehow it’s true. With NoSQL you can retrieve all information about specific product in a single request in simpler and faster way. Of course we can’t forget that a well-organized SQL database will be more efficient than badly-organized NoSQL database and on the other side the same. Another important aspect is safety. NoSQL databases are younger than SQL databases, so there are many mistakes that they haven’t released yet. SQL databases as older have already gone through a long process of adaptation. Following this path the risk of an unexpected error is offset to a minimum. NoSQL databases indisputable advantages is their scalability. Over time, there is a very high probability that you will be forced to expand yours database on another server or few servers. If you are using SQL database it will be difficult and tricky for you. Possibly the clustering will be the best option for you, but it’s still the challenge. NoSQL’s data model makes this process easier and most of them have been built with scaling functionality from the beginning. speed and scalability is imperative.